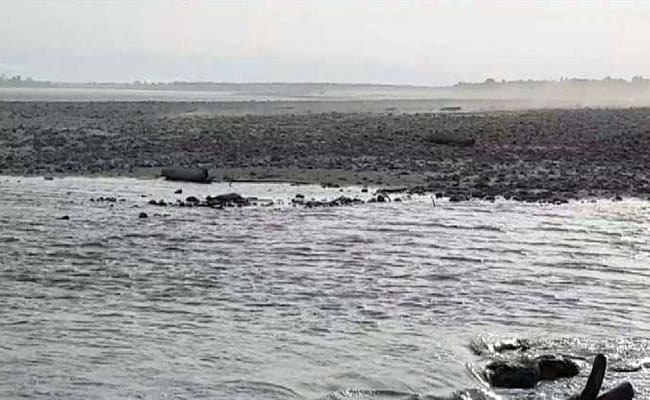 Guwahati: Scientists who are studying water issues in the Brahmaputra basin have agreed that a 6.4 magnitude earthquake that struck Tibet in November could have made the water of Siang River, in China, to turn muddy as it flowed into India. Siang is known as Tsangpo river in Tibet and it enters India in Arunachal Pradesh; it becomes Brahmaputra near Sadiya in Assam. That explanation may have ended speculations that man-made factors in China could have led to the Brahmaputra waters turning muddy or even black, triggering concern in Arunachal Pradesh and Assam. But China has informed that a real threat could emerge -- the quake has formed three huge lakes by the river on the border and they could breach the banks and trigger flood. Though China says it will keep updating India about the situation, both Assam and Arunachal Pradesh want New Delhi to do something to mitigate any crisis as these two states would be the worst-hit in case of a massive flood. "According to the preliminary verification by the competent department, the high turbidity of the lake in the remote, uninhabited area near the... eastern section of China-India border was caused by natural disaster, not man-made accident," said Hua Chunying, spokesperson of China's Foreign Ministry in Beijing on Wednesday. "We noted that the responsible Indian department has also analysed and clarified the situation," Mr Chunying said. China's clarification was followed by a warning that earthquake has created fragile lakes and if they breached their banks, both Siang and Brahmaputra could overflow. "We urge PM (Narendra) Modi to use all resources like satellites... to ascertain the exact location where these lakes were formed. Because if these lakes burst it will bring devastation for Assam and Arunachal Pradesh," Lungkang Ering, a youth activist from Pasighat in Arunachal Pradesh, told NDTV. Those involved in scientific research in the Brahmaputra basin say past experiences in fighting floods are being ignored. "Similar type of events happened in 2000 and there were heavy floods in Arunachal and even in the upper reaches in China," said Dulal Goswami, a retired professor who has extensively studied the Brahmaputra basin. "A lot of time has been spent on doing much without finding the real reason, and the water turning muddy is only one event; it can trigger even bigger events," he said. For over a month now, Arunachal Pradesh and Assam have been seeing muddy water in the river. On Tuesday, Itanagar-based state Remote Sensing Application Centre also confirmed that landslides triggered by nine earthquakes of magnitude up to 6.4 led to the situation. "The earthquake... deposited huge debris and partially blocked river Yarlung Tsangpo's course in Tibet... found to be the cause of the waters of Siang turning muddy," the remote sensing centre said in a statement. The two BJP-ruled states in the northeast had been waiting for the centre to react to the issue. "We were apprehending... something was happening on the other side of the border. It came late, but it is good that China has come out with a clarification that there was an earthquake, landslides," Assam Finance Minister and the BJP's strategist in the state Himanta Biswa Sarma told NDTV. "I think the government of India should go to the root of it," he added.